I have a remote client machine that is sending out DHCPDISCOVER's. The server is responding with a DHCPOFFER, but there is no DHCPACK. This repeats about every 30 seconds from the same host. Is there something I can do remotely or do I need to get someone to reboot it? It's in a data centre so I may have to travel there to do it! Thanks for the suggestions. I've had all the machines rebooted, but I still have issues. I think there is an issue with my configuration. Does this look correct? # the hosts to be running dhcp but always get the same address? You you are missing the DHCPREQUEST before the DHCPACK in your description. If the client is on a different subnet than the DHCP server the DHCPOFFER is sent unicast to the DHCP-relay on port 67 UDP. The DHCP-relay agent broadcasts the DHCPOFFER to the subnet on UDP port 68. I'd investigate connectivity issues related to the DHCPOFFER. Track it and see if it finds its way back to the client and if it does, why is the client not DHCPREQUEST:ing the address. A common dhcp relay agent is the "ip helper-address" option in cisco switches under a specific interface. 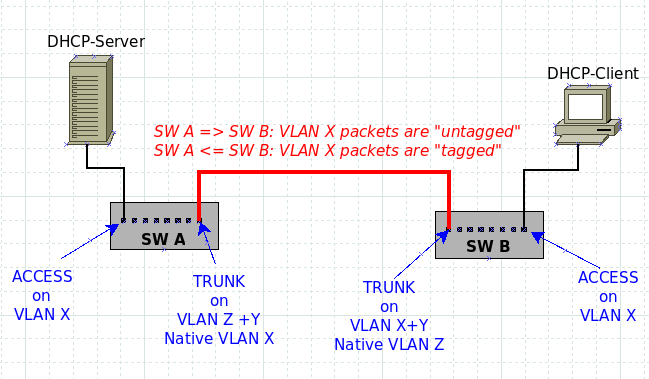 Supposing your DHCP-server and DHCP-client are both connected to the same ethernet segment, and supposing such ethernet segment spans several L2-switches interconnected with various "trunk" (802.1q) links, I've run into similar issues when there was a mismatch between the configuration of at least one trunk link. In detail, the never-ending cycle of DHCP-DISCOVER / DHCP-OFFER (as seen from the DHCP-server side), let me think that the DHCP-client is NOT receiving the DHCP-OFFER and, hence, stick reissuing the DHCP-DISCOVER message. Such DHCP-DISCOVER (as seen from the DHCP-client side) is correctly received from the DHCP-SERVER. VLAN X traffic sent by SW B to SW A along the trunk (or from the DHCP-Client to the DHCP-server), is TAGGED. due to the native VLAN setup of the trunk port of SW B, the DHCP-Client will not receive packets from DHCP-Server. will show if the client receive the DHCP-OFFER from the DHCP-SERVER, or not. Things are more difficult to troubleshoot if you can not control the client-side. dhcpd could not write to /var/lib/dhcp/dhcpd.leases. The IP address the DHCP server gave is already in use by another device. Usually you'd see a DHCPNAK though. Fortunately both should be easy to test. Ping the IP address and check relevant firewalls. I've been learning about firewalls using virtual box and I had a similar issue not getting the DHCPACK on the server and it turned out that was using the wrong virtual box network settings for the test green (internal) network for a ubuntu firewall vm and a test ubuntu client vm. If you use the NAT network rather than vb internal network the client vm gets its ip from vb rather than the DHCP server vm. The logs show the server getting the request from the client but the client gets its ip from vb instead so you never get an ACK sent back to the server. Not the answer you're looking for? Browse other questions tagged linux isc-dhcp dhcpd or ask your own question. Can I configure ISC DHCP to issue the same fixed-address to every client?